You may reach a point in your testing career where you have found bug and may not able to reproduce it. There are many reasons for the same but most of the time you’re supposed to file such bugs. During the interview, this questions often comes and candidates find it harder to answer the same. The interviewer is not interested in knowing the bug, but how did you managed to report it and what steps did you took to address it. 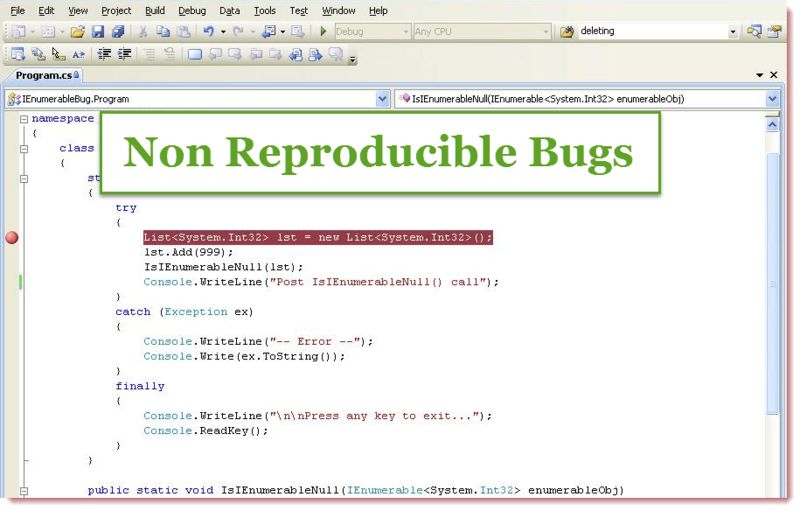 What are not reproducible bugs? The bugs which are not easy to reproduce under same test steps under which they were found at first place, showing their presence once or in rare circumstances under test. These are the type of bugs which we often find harder to isolate and to get them fix becomes mundane task. What are some of the reasons such bugs occur? If the bug is occurring due to the platform changes and the library conflicts, then such bugs are harder to isolate. Let’s say a bug appears during the installation of the software under particular operating system with specific memory.Same bug doesn’t appear under another system with same operating system and memory. This is due to the fact that such bugs are often affected by current running processes and the libraries installed and under use in the memory. Some bugs also appear due to the memory location accessed outside the specific location. Or if the accessing the specific location is not possible under that particular instant due to operating system resource priorities. Some bugs also vanish outside the scope of the debugger. Once the debugger is turned off such bugs don’t appear leaving us to assume the conflict happens with debugger tool or libraries. Another type of bug is specific to the environment changes in the operating system. When I say environment changes, I am pointing to the development libraries and dependencies installed on the operating system. There are also some scenarios where few things affects in order for bug to appear. Let’s say if the particular process in the operating system is not free and it makes the operating of particular software harder. In such case, if you try to reproduce the same steps then it becomes harder to find the bug again. There are many other different reasons under which bugs are harder to isolate and reproduce. How to get such bug fixed? What should a tester do to get it fixed? If you can’t reproduce a bug, you first document the steps and repeat them under different environment to find it again. And if the bug is unable to reappear, then you should ask for more information from customer/client regarding the bug reproduciblity. If the bug has stopped reappearing at the client side, you can close the bug as “unreproducible” or similar flag in your defect tracking tool. Capture as much information as you can to write new test cases for the same test steps with different environment, user error and data corruption scenarios. Check the logging software in the background to identify the system sources when the bug was found. Ask client or the test executor to use screenshot recording tool like Camtasia (or any other tool specific to that operating system) to record the bug. Compare the environment logs and the software debugger logs before and after noticing such bugs. Examine the test execution results and evaluate the changes in the tests. Examine the test data and modify as per the client test inputs or adjust to reproduce the bug. Add the test steps that gets the execution closer to the bug. Do keep a screenshot or documentation of the error message that appeared during the bug occurance. Often project managers don’t let the QA team to get involved with client. So you have to be clear on topic of bug reproducibility to managers. This has to be addressed in such a way that manager can explain the absence of bug in easy to understand way to the customer.The business risk of that bug and the clients interest with the QA team decides how much the bug can get priority for fixing in subsequent release.